Sen. Tim Larson, the bill’s sponsor, answering Sen. Len Suzio. The Mashantucket Pequot and Mohegan tribes won the first half of their home-court fight with MGM Resorts International over the rights to gaming expansion in Connecticut as the Senate voted 24-12 early Wednesday for a bill authorizing the tribes to jointly develop the state’s first casino off tribal lands. The bill that now goes to an uncertain fate in the House of Representatives would allow the tribes to build a casino off I-91 in East Windsor in an effort to blunt the loss of gambling dollars to Massachusetts once MGM opens a gambling resort under construction in Springfield. “We did what we had to do. We stood up for Connecticut workers,” Senate Majority Leader Bob Duff, D-Norwalk, said shortly before the final vote at 12:35 a.m. The Senate unexpectedly took up the bill shortly before 10 p.m. Tuesday, a day when MGM intensified its opposition, buying $400,000 in television time to air a commercial saying the state would be forgoing millions of dollars in license fees and other revenue if it cut a no-bid deal with the owners of the tribal casinos. Uri Clinton of MGM, at left, with two of his lobbyists, Paul Nuñez and, at far right, Jane Murphy. The tribes would pay no licensing fee under the bill approved Wednesday, only an annual tax equal to 25 percent of gross revenues from table games and slots. The first $4.5 million in slots revenue would be set aside for annual grants of $750,000 to each of six communities: Hartford, East Hartford, Ellington, Enfield, South Windsor and Windsor Locks. East Windsor struck a separate deal with the tribes, who say they would pay the town about $8.5 million annually in property taxes and mitigation fees. 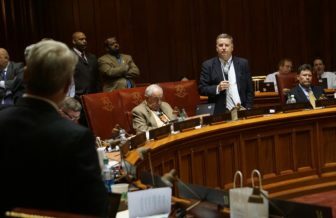 Uri Clinton, a senior vice president and legal counsel of MGM Resorts, said his company will press its case in the House, where Democrats have suggested they are seeking $100 million from casino expansion, that Connecticut can do better. Sen. Douglas McCrory, D-Hartford, dismissed the $750,000 grant as a token payment to a distressed capital city that is considering bankruptcy. He equated the money with giving his constituents a few fish, not the ability to catch them. Sen. John Fonfara, D-Hartford, also opposed passage. 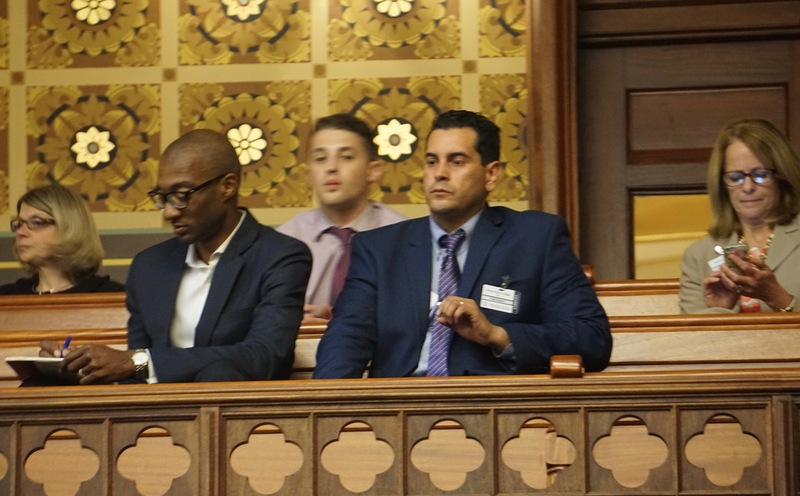 Watching from the gallery was Marc DiBella, the city’s Democratic chairman and one of the lobbyists hired by MMCT, the joint venture of the tribes. With an eye on tapping the lucrative New York City market, MGM is pushing a bill that would create an open competition for the right to develop a casino resort in lower Fairfield County, a measure opposed by Gov. Dannel P. Malloy as a threat to a revenue-sharing deal worth about $260 million annually. In return for the exclusive rights to gaming in Connecticut, the tribes now pay the state 25 percent of the gross slots revenue generated at their Foxwoods Resort and Mohegan Sun casinos, generating $7 billion for the state since 1993. From a high of $430 million in 2007, the slots revenue has dropped each year in the face of growing competition in New York, Massachusetts and Rhode Island. 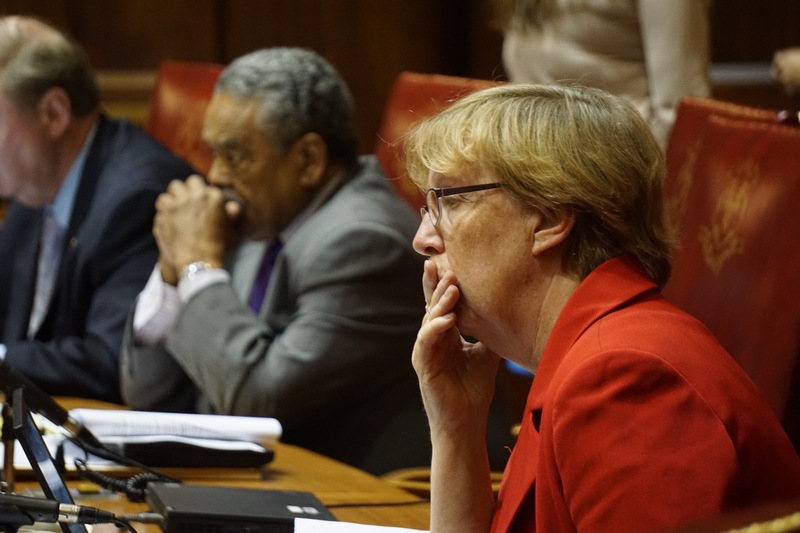 Sen. Cathy Osten, D-Sprague, whose eastern Connecticut district is home to both tribal casinos, said the tribes deserved the state’s help. The tribes issued a statement thanking the Senate — and reminding the House that the Bureau of Indian Affairs recently affirmed that granting them a commercial license would not jeopardize their existing arrangement with the state. The governor said Friday in an interview with CT Mirror that he was neutral on the question of whether to expand, but if legislators were to permit the state’s first casino off tribal lands, they should respect the state’s long-standing exclusivity agreement with the Mashantucket Pequot and Mohegan tribal nations. Sen. Cathy Osten, a co-sponsor of the bill, as the debate began. Both tribal casinos are in her district. The governor’s spokeswoman, Kelly Donnelly, reiterated Wednesday that Malloy’s position is firm. The Senate vote and Malloy’s implied threat of a veto dim the possibility of MGM winning passage of an open-competition bill, but there is a third possibility: Allow no casino expansion, an option favored by opponents of gambling and the operators of off-track betting parlors. Attorney General George Jepsen has raised two legal issues about a deal with the tribes: One, that the Bureau of Indian Affairs could negate the exclusivity agreement, a possibility the bureau recently downplayed; and two, giving the tribes the right to a commercial casino without competition could violate the equal protection and commerce clauses of the constitution. Shortly before debate began, the governor’s chief of staff, Brian Durand, conferred with Vinnie Mauro, the Senate Democrats’ chief of staff, outside the Senate chamber. Twenty steps away, four MGM lobbyists surrounded Sen. Eric Berthel, R-Watertown. The bill was called. In the chamber, Sen. Tim Larson, D-East Hartford, rose to explain a master amendment co-sponsored in the Senate by three Democrats and three Republicans. Lobbyists filed into the gallery to watch, as did Clinton, the MGM executive who has commuted regularly from Las Vegas to Hartford on red-eye flights to urge passage of an open-competition bill. Clinton and one of his lobbyists, Jane Murphy, left during the debate to answer a question from Sen. George S. Logan, R-Ansonia. Clinton and Logan conferred near an elevator bank. Logan voted for passage. Berthel voted against. After the vote, Larson defended the Senate for not insisting on a licensing fee from the tribes, saying the goal of the bill was to stabilize the existing revenue-sharing deal with the state. A majority of each party was in favor: Democrats voted 14-4; Republicans voted 10-8. Senate Bill 957 would the state’s two federally recognized tribes to jointly develop a casino in East Windsor.